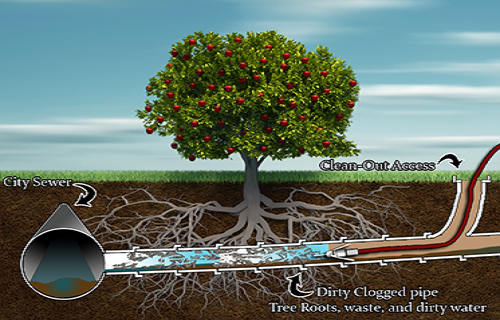 The Plaid Plumbers' High pressure sewer jetting is method of cleaning sewer & drain lines using high pressure water. An engine or other power source powers a high pressure water pump that produces water under pressure. All high pressure jetting units are rated as to Pressure (PSI) and Water Flow (GPM); both a direct result of the available engine’s horsepower. Water from the high pressure pump is delivered to a hose reel containing high pressure jetting hose matched for the pressure and flow of the system. When a nozzle is attached to the end of the jetting hose, pressure is created within the system. Nozzles are sized to match the design out of the engine & water pump plus factoring pressure loss due the diameter and length of the high pressure jetting hose. Every nozzle is designed to direct high pressure streams of water to pull the high pressure jetting hose through a pipe. 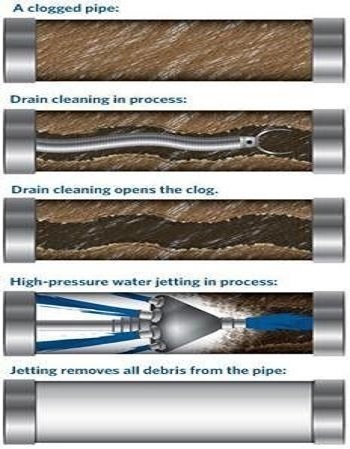 Angles of the water stream can be varied; water streams directed more toward the pipe wall surfaces produce better cleaning results while diminishing the pulling power of the nozzle. Water streams directed towards the centerline of the pipe provide maximum pulling power but decreases pipe wall cleaning effectiveness.